With the December 2012 release of the elusive, limited edition Casa Sauza XA, celebrated tequila house Casa Sauza launched its first-ever global extra añejo expression. Casa Sauza has been in the tequila business since 1873, and this latest, ultra-premium addition to its award-winning tequila portfolio expertly balances Weber blue agave notes with rich wood characters. The 40 percent alcohol, 100 percent agave Casa Sauza XA builds on growing consumer interest in sophisticated, more refined tequilas. 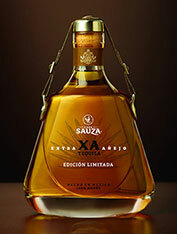 Casa Sauza XA is aged for more than three years in small American oak barrels. It is available exclusively at fine liquor and retail stores in the United States and Mexico, as well as in international duty-free shops. Only 12,000 750-mililiter bottles have been produced. The elegant glass tequila decanter is accented with a distressed leather strap and metal buckle and housed in a signature box. Each bottle is numbered and has a suggested retail price of approximately $150 U.S. The Weber blue agave plants are hand selected by the company’s jimadores and distillers. Its signature fresh agave notes and the distinct aroma of jasmine, hibiscus, almonds and chocolate distinguish the pale golden amber tequila. "Limited-edition bottlings and special small batch, premium expressions are among the most significant new developments in the tequila category. Casa Sauza XA (Extra Añejo) is an exciting addition to our portfolio," said Beam Inc. global tequila marketing director Gigi Dadan in a Casa Sauza press release. "This new, signature expression is a nod to our pioneering spirit and dedication to creating exceptionally fine tequila for today's sophisticated palates." 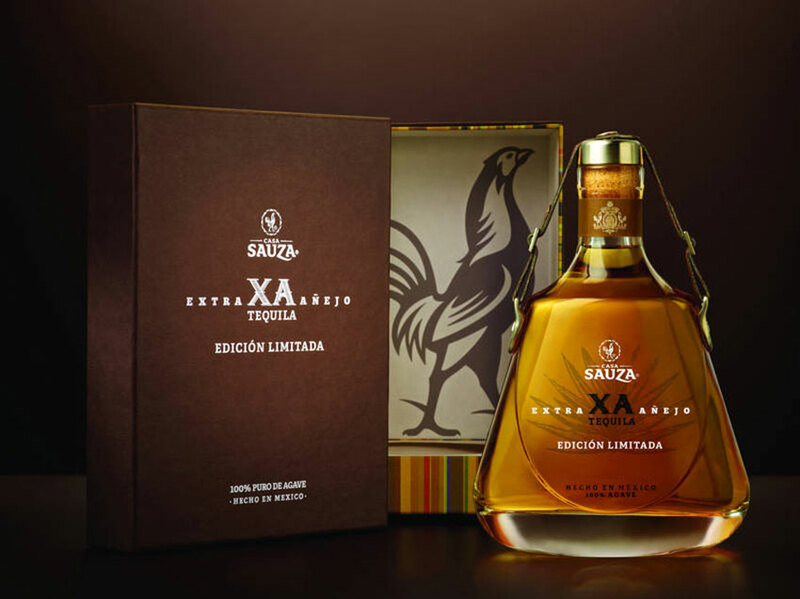 "With its extra age and rich, smooth finish, Casa Sauza XA, Edición Limitada is like a fine cognac or whisky," Casa Sauza executive chef and sommelier Victormanuel Martinez said in the press release. "When served in a nosing glass, the aroma of Casa Sauza XA unravels, captivating the senses to deliver a refined, one-of-a-kind tasting experience. It's perfect when paired with coffee or rich desserts, such as tiramisu, black forest cake or even pecan pie." Press Release: DEERFIELD, IL--( Dec 11, 2012) Casa Sauza®, the family of tequila brands, heritage and craftsmanship since 1873 of Beam Inc. ( NYSE : BEAM ), announced an addition to its award-winning tequila portfolio today -- Casa Sauza XA, Edición Limitada (40% ABV). February 2013 - British Designers Have Created Structural Packaging and Graphics for Beam’s Mexican Tequila Casa Sauza XA. 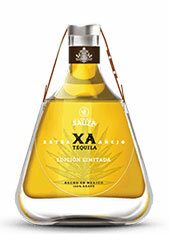 Beam Global has re-launched its limited edition tequila, Casa Sauza XA, with a new bottle. The design was created by UK-based Studio Davis in collaboration with Osborne Pike. 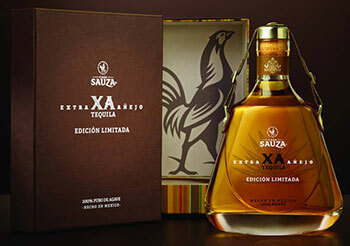 The 750ml Edición Limitada bottle has been created to reflect Casa Sauza’s heritage and craftsmanship. Studio Davis and Osborne Pike took inspiration “from La Quinta, the spiritual home of the Sauza family; La Constancia, the ageing room; Obsidian, the ancient volcanic rock that gives the land in this region its fertile properties; and Don Cenobio Sauza, the founder of the distillery”. UK-based structural packaging design consultants Studio Davis and brand and packaging design consultants Osborne Pike have collaborated to create a distinctive 750ml bottle design for Beam's Casa Sauza XA. As one of the world's leading premium spirits companies, Beam is Crafting the Spirits that Stir the World. Consumers from all corners of the globe call for the company's brands, including Jim Beam Bourbon, Maker's Mark Bourbon, Sauza Tequila, Pinnacle Vodka, Canadian Club Whisky, Courvoisier Cognac, Teacher's Scotch Whisky, Cruzan Rum, Hornitos Tequila, Knob Creek Bourbon, Laphroaig Scotch Whisky, Kilbeggan Irish Whiskey, EFFEN Vodka, Pucker Flavored Vodka, Larios Gin, Whisky DYC, DeKuyper Cordials, and Skinnygirl Cocktails. Beam is focused on delivering superior performance with its unique combination of scale with agility and a strategy of Creating Famous Brands, Building Winning Markets and Fueling Our Growth. Beam and its 3,200 passionate associates worldwide generated 2011 sales of $2.8 billion, volume of 34 million 9-liter cases and some of the industry's fastest growing innovations. Sauza® Tequila, 40% alc./vol. ©2012 Sauza Tequila Import Company, Deerfield, IL.